This post has been taken from here, DeZeen. Stay tuned for the next post where we will investigate examples of this getting much closer to market than you think! 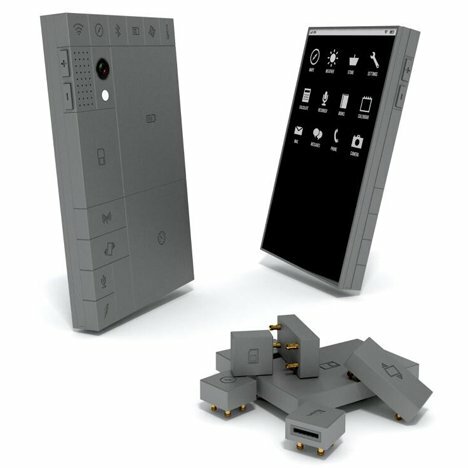 Dutch Design Week 2013: Design Academy Eindhoven graduate Dave Hakkens' concept for a mobile phone made of detachable blocks has gone viral, attracting over 16 million views on YouTube and garnering almost a million supporters online (+ movie + interview). "I put the video online and in the first 24 hours I had like one million views on YouTube," Hakkens told Dezeen. "I got a lot of responses to it." Dutch designer Hakkens, who graduated from Design Academy Eindhoventhis summer, presented his Phonebloks concept at the academy's graduation show in Eindhoven today at the start of Dutch Design Week. 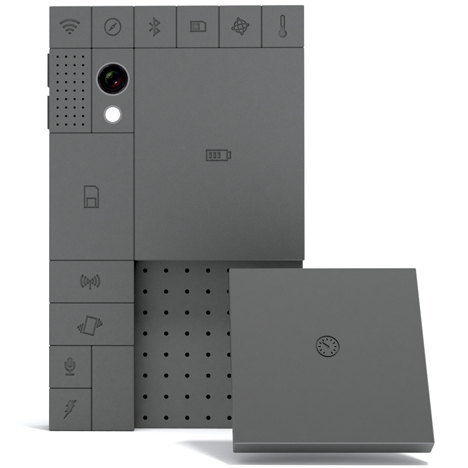 Phonebloks is a concept for a phone made of swappable components that fit together like Lego, with each component containing a different function. This means that components can be replaced or upgraded without having to throw away the phone. "Usually a phone is integrated into one solid block and if one part gets broken you have to throw away the entire phone," said Hakkens. "But this has different components, so if your battery is broken you can replace the the battery or if you need a better camera you only upgrade the camera component. So you don't throw away the entire phone; you keep the good stuff." Last month Hakkens uploaded a video explaining the concept to YouTube, where it went viral and has now been watched over 16 million times. He then put the idea on "crowdspeaking" site Thunderclap, where instead of donating money, supporters donate their social reach. He now has over 900,000 supporters on the site, and when the campaign closes on 29 October a message about Phonebloks will automatically be sent to each supporters' social media contacts, giving Hakkens a total audience of over 360 million people. Hakkens said: "That's the whole point of this idea; to generate lots of buzz so companies see there's a huge market and realise they really need to make a phone like this." 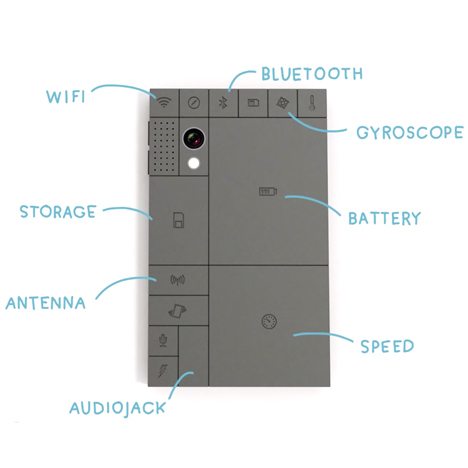 The Phonebloks concept features electronic blocks that snap onto a base board, which links all the components. Two small screws lock everything together. Users can choose components from their favourite brands or make their own modules. "You can customise your phone, replacing the storage block with a larger battery if you store everything in the cloud, or replace advanced components you don't need with basic blocks like a bigger speaker," says the video explaining the concept. Hakkens hopes Phonebloks will lead to fewer phones being thrown away, thereby reducing waste. "Electronic devices are not designed to last," the video says. "This makes electronic waste one of the fastest-growing waste streams in the world and our phone is one of the biggest causes." Marcus Fairs: What is Phonebloks? 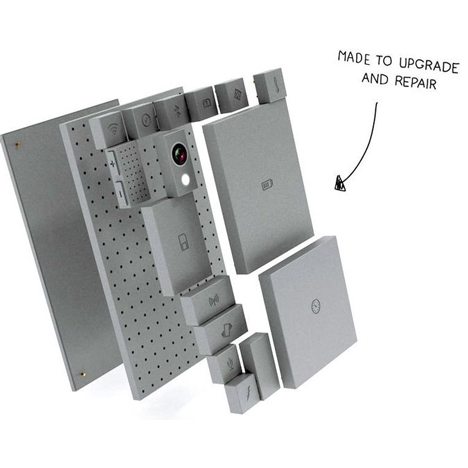 Dave Hakkens: Phonebloks is a phone made to upgrade and repair; it's a phone worth keeping. Usually we throw it away after a couple of years. But this one is made to last. Marcus Fairs: How is it made to last? Dave Hakkens: Usually a phone is integrated into one solid block, and if one part gets broken you have to throw away the entire phone. But this has different components, so if for instance only your battery is broken you can replace the the battery, or if it's slow after a couple of years you can change just the speed component. If you need a better camera you only upgrade the camera component. So in this way you don't throw away the entire phone; you keep the good stuff. Marcus Fairs: Tell us how it went viral. Dave Hakkens: The idea with this whole project is I'm just one guy at the Design Academy; I can't make this phone by myself. I can go to a lot of companies and pitch, ask them if they'd like to make my phone, but I thought I'd do it the other way around; so I gathered a lot of people who told companies they really wanted this phone. So I put this video online and in the first 24 hours I had like one million views on YouTube. I also gathered supporters so currently I have 900,000 supporters, and they all just wanted this phone. So now I have all this attention and I get a lot of nice emails from companies who want to work on this. Marcus Fairs: How did you spread the message? Dave Hakkens: You have this site called Thunderclap. On Thunderclap instead of crowdfunding you crowdspeak people; people don't donate money but instead they donate their friends and family. You say you're interested in a project and want to support it, so you donate your friends - their Facebook followers and Twitter followers - and on the 29 October automatically a message is sent out by those people saying "We want Phonebloks". That spreads to all their friends and families. So currently I have like 900,000 supporters but on 29 October we will reach 300 million people. So that's the whole point of this idea; to generate lots of buzz so companies see there's a huge market and realise they really need to make a phone like this. Marcus Fairs: What is the next step? Dave Hakkens: My idea succeeded from day one; I got a lot of responses to it. I've got a lot of people interested in developing it: engineers, technicians and companies. So right now I'm thinking what would be a logical next step. Crowdsource it on the internet? Work together with a company? That's what I'm thinking about now; how to realise the phone the best way.